During the past five years the United States has abandoned many of the nuclear arms control agreements negotiated since the administration of Dwight Eisenhower. This change in policies has sent uncertain signals to other countries, including North Korea and Iran, and may encourage technologically capable nations to choose the nuclear option. The proposed nuclear deal with India is just one more step in opening a Pandora's box of nuclear proliferation. The only substantive commitment among nuclear-weapon states and others is the 1970 Non-Proliferation Treaty (NPT), accepted by the five original nuclear powers and 182 other nations. Its key objective is "to prevent the spread of nuclear weapons and weapons technology . . . and to further the goal of achieving nuclear disarmament." At the five-year U.N. review conference in 2005, only Israel, North Korea, India and Pakistan were not participating -- three with proven arsenals. Our government has abandoned the Anti-Ballistic Missile Treaty and spent more than $80 billion on a doubtful effort to intercept and destroy incoming intercontinental missiles, with annual costs of about $9 billion. We have also forgone compliance with the previously binding limitation on testing nuclear weapons and developing new ones, with announced plans for earth-penetrating "bunker busters," some secret new "small" bombs, and a move toward deployment of destructive weapons in space. Another long-standing policy has been publicly reversed by our threatening first use of nuclear weapons against non-nuclear states. These decisions have aroused negative responses from NPT signatories, including China, Russia and even our nuclear allies, whose competitive alternative is to upgrade their own capabilities without regard to arms control agreements. Last year former defense secretary Robert McNamara summed up his concerns in Foreign Policy magazine: "I would characterize current U.S. nuclear weapons policy as immoral, illegal, militarily unnecessary, and dreadfully dangerous." It must be remembered that there are no detectable efforts being made to seek confirmed reductions of almost 30,000 nuclear weapons worldwide, of which the United States possesses about 12,000, Russia 16,000, China 400, France 350, Israel 200, Britain 185, India and Pakistan 40 each -- and North Korea has sufficient enriched nuclear fuel for a half-dozen. A global holocaust is just as possible now, through mistakes or misjudgments, as it was during the depths of the Cold War. Knowing for more than three decades of Indian leaders' nuclear ambitions, I and all other presidents included them in a consistent policy: no sales of civilian nuclear technology or uncontrolled fuel to any country that refused to sign the NPT. There was some fanfare in announcing that India plans to import eight nuclear reactors by 2012, and that U.S. companies might win two of those reactor contracts, but this is a minuscule benefit compared with the potential costs. India may be a special case, but reasonable restraints are necessary. The five original nuclear powers have all stopped producing fissile material for weapons, and India should make the same pledge to cap its stockpile of nuclear bomb ingredients. Instead, the proposal for India would allow enough fissile material for as many as 50 weapons a year, far exceeding what is believed to be its current capacity. So far India has only rudimentary technology for uranium enrichment or plutonium reprocessing, and Congress should preclude the sale of such technology to India. Former senator Sam Nunn said that the current agreement "certainly does not curb in any way the proliferation of weapons-grade nuclear material." India should also join other nuclear powers in signing the Comprehensive Nuclear Test Ban Treaty. There is no doubt that condoning avoidance of the NPT encourages the spread of nuclear weaponry. Japan, Brazil, Indonesia, South Africa, Argentina and many other technologically advanced nations have chosen to abide by the NPT to gain access to foreign nuclear technology. Why should they adhere to self-restraint if India rejects the same terms? At the same time, Israel's uncontrolled and unmonitored weapons status entices neighboring leaders in Iran, Syria, Turkey, Saudi Arabia, Egypt and other states to seek such armaments, for status or potential use. The world has observed that among the "axis of evil," nonnuclear Iraq was invaded and a perhaps more threatening North Korea has not been attacked. The global threat of proliferation is real, and the destructive capability of irresponsible nations -- and perhaps even some terrorist groups -- will be enhanced by a lack of leadership among nuclear powers that are not willing to restrain themselves or certain chosen partners. Like it or not, the United States is at the forefront in making these crucial strategic decisions. A world armed with nuclear weapons could be a terrible legacy of the wrong choices. 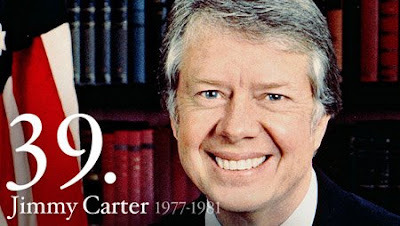 Former president Carter, a Democrat, is founder of the Carter Center.